James Joyce's masterpiece "Ulysses" follows main character, Leopold Bloom, as he traverses the streets of Dublin during the course of a single day. This is no ordinary day, however. In Joyce's hands, the brief sliver of experience held within two dozen hours of time becomes a vast allegorical passage containing a rich and expansive cosmology. One of the central ideas of Ulysses is that there is no such thing as "ordinary"..that life as it is lived cannot escape the epic significance that our very existence implies. The realness of this transcendent proclamation is somewhat hard to feel when one is awfully bored and has perhaps been spending several listless hours parked in front of the television, but I assure you that even in the most prosaic moments of quotidian reality, the universe might still be found. 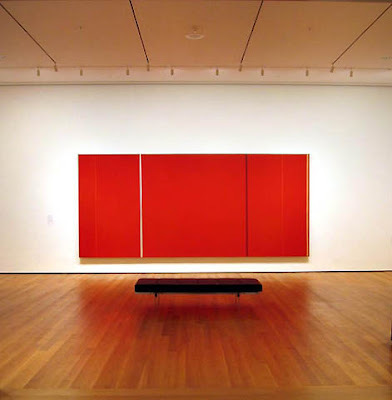 Maybe that's why such bombastic rhetoric from High Art icons such as Barnett Newman often is so hard to take in today's jaded world. Imagine getting worked up about a single line of white in a red field...it's about as exciting as dirt. I'm not about to bow prostrate in search of Onement before this windbags' pretentious field of ambition and ego...even if they are quite fetching paintings. So where does that leave abstract artists today ? What do their paintings mean bereft of all the hyperbolic rhetorical heat and flash? 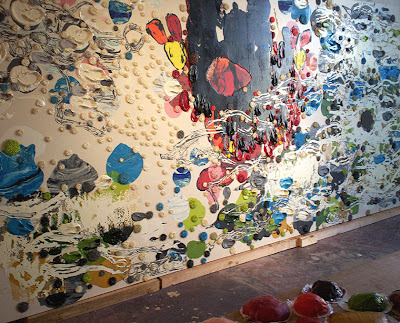 In the case of Dennis Hollingsworth, one of my favorite abstract painters in Los Angeles, the answer for me has been found in a recent work I was lucky enough to catch a glimps of hanging barely dry in his Chinatown studio. Dennis is a blogger, and so it's been interesting for me to see a more complete picture of this artist through his online journal. 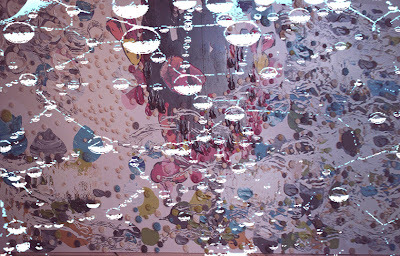 A weblog is afterall, a type of hypertextual network of ideas, people, places, events and images...a "cosmology". The most recent post is just one vector of a vast network that stretches into a deep field of information. So, one day..one post..has contained within it a type of deeper implied significance. 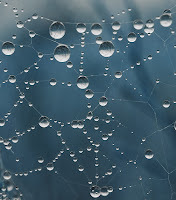 I'm reminded of Indra's Net, a cosmological image culled from Hindu mythology to describe reality as a type of infinite web from which hangs an endless quantity of translucent beads of dew. The surface of every jewel completely reflects every other, and the net as a whole. Likewise, each reflected jewel in itself reflects every other, that reflects every other, that reflects every other, without end, as mirrors to infinity. All of this is a way of saying that embedded within every single ordinary moment is the Universe. The reason I like this piece by Dennis so much is because I can somehow see with great clarity the accumulation of the seemingly ordinary moments of life into something quite large and extra-ordinary. Dennis writes abouts his paintings in an exciting and action packed manner, often employing a type of poetic prose in which the creative act resembles a terpsichorean sport that plays out on a razors edge, chaos and disorder threatening constantly . The creator must fight his way through these trials and tribulations, somehow holding the piece together until falling exhausted at the end..the painting hopefully still holding. I enjoy and relate to this romantic notion of creativity, and in Dennis' hands it is contrasted from the more mundane aspects of life as a privileged and special act. This piece is unusually large and was probably quite time consuming to produce....so the ritual has been stretched out over the course of perhaps a month, drawn out into days...ordinary days in ordinary weeks. With the accumulation of time, I start to plot an imaginary map over the surface of this canvas..perhaps a type of log of artistic intent running strangely parallel to the larger universe contained within the artists blog. It is not possible, afterall to separate an artistic practice from the world we live in as such. Between the ecstatic moments of creation..the artist drives home, walks the dog, makes dinner, and so forth. Creativity is part of a larger life..and all lives are ordinary in their own unique way. This might ultimately be the best way of concieving the Creative Act-as but one dimension of a holistic enterprise..perhaps just as ordinary and humble as taking out the trash....but nonetheless imbued with a Universal significance in which all acts are divine. It's much easier to see G-d in a painting when the artist isn't talking so loudly about it.